You are here: Home > myTouch HD To Come In Four Colors, Including Eggplant! myTouch HD To Come In Four Colors, Including Eggplant! So while many of you have been discussing the myTouch HD leak, if it’s real or not, just what “dual processor” truly means and what not, we’ve been working on the most important aspect of the release. The colors! Ha-ha I kid, but seriously this plays an important role in the buying decision for me so assuming at least a few of you think like I do, I investigated and got some answers. Without further ado, the myTouch HD will come, as the myTouch 3G did before it, in Black, White and Red but also…drum roll please…in eggplant purple! Big applause! In case anyone is wondering what Eggplant looks like, click here. I HAD EGGPLATE FOR LUNCH..JUST NOW..YUMMY! A superphone in colors? Fantastic! I just hope it doesn’t have that silver trim in the front, and hopefully the phone comes in full black, if not I’m still buying. This is a phone I’ve been waiting for and I can’t wait! Ha! I love the eggplant link. Though it does prove slightly confusing as there are many shades of eggplant. Which one shall it be? IM so torn…. G2 or Mytouch HD….. Im thinking the latter… guess i will have to get rid of espresso. You are wrong. Ha. The second/free phone to be attached to another line that has a full upgrade. Yea me too!! David…how about a side-by-side comparison of the G2 and the Mytouch HD for us undecided. Cyan mod 6 to the rescue! Nice. I’m probably buying the HD7 though and putting Android on it. Still, nice color choices. ditto!!! I heard the screen is 4.5. so it’s cool! but since the default o.s is Winmo7, imma wait a bit longer until I can be able to run android on it, and plus the price i hope is low by then.. i still lovin my hd2 on android. HD7? Don’t you mean HD3?? It’s going to be called the HD7. I have a friend who works Tier 3 Technical Support and it shows in their system as HD7. I think I’m with you. I’ll have to figure out how to do it… but I’m liking the HD7 just not a winmo fan but if it can run android…. I”M IN…. You might have saved me from the g2/mytouch HD hell…. Well then if it comes in Red then I’ll pick it up in that color. Green is my fav, but red is better than just plain black or white. So do any of these colors come with stock Android. No seriously Gingerbread should be on my Nexus around the time this gets released so after I see what it has to offer then I will decide if the Mytouch HD is better than the Nexus One. Its sad that this will have Expresso/Sense. I wonder what Gingerbread will bring and if LauncherPro and ADW will be able to match it. Why not blue? or Silver? +1 to you good sir for A1 is awesome!!! What a terrible name for a color. If you want to make it purple, why not just call it purple? Do you really have to call it eggplant? I blame Crayola for this dirty trend. Give em time. With the original myTouch red was called “Merlot”, now it’s called “red”. It’s nice to know my “Merlot myTouch 3G” will be replaced with a red myTouch HD. EggPlant Purple FTW!!! That’s going to be the color MyTouch HD “I” get!!! WHOot! favorite color if it’s a deep, dark color as I think it will be. It’s great to have choices. For T-Mobile to put out two very high quality devices for the Android platform should keep the customers very happy, it makes me very happy.This new My Touch HD has me very curious, I would like a very good explanation of the specs. This new processor is suppose to be top shelf, Would like to know more about it and just what it will do for the phone. wow we were thinking along the same lines but u beat me to it. We don’t know what processor the myTouch HD will be using, but I bet you dollars to donuts that it’ll be an MSM8255 which would be very similar to the G2’s chipset. Not only are these chips a die shrink from previous generation Snapdragons, but also Qualcomm incorporated a new GPU that utilizes ATI technology obtained from purchasing their mobile division from AMD. I JUST WANNA BE THE FIRST TO CONGRATULATE AND THANK TMO. I HAVE BEEN VERY CRITICAL OF TMO AND THEIR LINE UP OF PHONES. HOWEVER, IN THE NEXT MONTH OR SO, THEY WILL RELEASE TWO GREAT PHONES TO THEIR LOYAL CUSTOMERS!! ALL I WANTED WAS A TOP OF THE LINE PHONE TO COMPETE WITH TOP PHONES FROM OTHER CARRIERS AND AFTER A LIL RED TAPE YOU HAVE FINALLY DONE IT. AND FROM THE LOOKS OF THE ROADMAP, UR NOT FINISHED. THANKS AGAIN. I URGE OTHERS TO SHOW GRATITUDE AS WELL B/C THERE WAS A LOT OF HARSH CRITICISM OF TMO ON THESE BLOGS. Okay now release the damn phones so i could buy em…lol. Here, Here! I’ll second that! I’ve been chaffing under my Cliq XT, desperately trying to afford a Vibrant, but with all the new releases coming up, I’m almost glad I’ve had to wait. By the time I can get another phone (around Nov. or Dec.) I’ll be able to walk into a store and test three or four awesome phones side-by-side. Who could ask for better? Seriously if pulled out a red, white or purple My Touch HD phone while my 2 other friends are using the Iphone 4 and the Samsung Epic or even a Vibrant, they would probably laugh then make me pay for their lunch since I obviously saved some money paying for this plastic toy looking phone. These colorways confirmed that the G2 will be the “mature” looking device…now my 12 year old daughter would one these colors! Do you drive a beige Accord? If a phone looking “mature” is the reason your going to buy a phone then you own a phone for all the wrong reasons. Go buy an iPhone if you just want a phone people recognize but doesn’t really do anything. Yeah, but then you could smoke their asses with the HSPA+ Dual-core awesomeness of the myTouch HD. This thing could ask those phones, “Who’s your daddy?” in any color. If 45nm dual-core means serious processing power and still retains today’s average battery life, this thing could come in tutti-freaking-frutti! So sure these aren’t the real specs are you? i don’t care what color, just so i can chat over wifi. If this is really the phone that’s coming out as the long awaited emerald project then I am really disappointed… The phone looks terrible!!!!! Please don’t let this nor the Winpho be emerald project, I’m keeping faith in you Tmo! soooo…., what about the G2? is there a black one coming out? Who cares. colors are ok. Now give me specs. ok this will change video sexting for ever! Thank you HTC! Almost forgot. Purple for my girl and black or white for me! Did I read that right that it says dual core 1ghz procceser? someone please confirm! guarantee it won’t be a dual core like you’re thinking it will be. Remember the UMA lite that was supposedly on the Charm?? This is just another example of that. Again, Guarantee it’s not a dual core. Also disappointing screen size and GOD AWFUL design. If it had a quad-core processor I personally couldn’t pick it up based on those embarrassing looks alone. A) You guarantee something twice without any hard facts to back it up. B) You really wouldn’t buy the only quad-core phone just because of aesthetics. Whats going on tomorrow with HTC that Tmonews will be there. Its in Europe so what does that have to do with T-mo U.S.
Who said we are going?? I’m not going?! Sept 16 is the Samsumg Event. Where they will anounce The Media Hub. Maybe Froyo 2.2? They should make one in rainbow. I still dont see why anyone in their right mind would get this phone over the vibrant. Love my little monsters and long live the G.A.Y.S! That too bad… I was kinda hooping for Zune Brown. LOL… Microsoft admitted that the biggest fail of its successful Zune line was the model in brown. I recall seeing the brown Zune at a deep discount on Woot. While it was on the 24 hour sale many people posted complaints that Woot was not selling other colors. My wife has a slide and the Espresso UI is just a slightly different Sense. It has all the Sense widgets, the homescreen preview thumbnails, but with a more traditional (if odd-looking) bottom dock. It also has various scenes or MyModes, that let you set different homescreen set-ups for different situations. You could have a work mode with all your productivity apps front and center, then switch to entertainment mode with all your media, RSS, and friendstream widgets. It’s pretty snappy, even on the Slide’s 600Mhz processor. Besides, if you don’t like it, there’s always ADW, LauncherPro, LiveHome, etc, etc, to replace it with. I need a comparison between this and the G2 because the G2 is looking more and more like a piece of trash. Why wouldn’t they give the G2 these upgrades? I hate the mytouch interface, I had a mytouch slide and there were so many things that didn’t make sense with the device. I’m totally confused. I don’t want a dumbed down kiddy smartphone. I want a smartphone geared to adults with all the bells and whistles… (no offense to the teens out there)… WHAT IS T-MO DOING? Besides the G2 is ugly and the mytouch slide was really cheap (especially the keyboard area where the bkg pastic didn’t lie flat)… I hope the MyTouch HD doesn’t look like a cheap piece of plastic like the vibrant….. UUUGHHH…. Will the Mytouch HD have stock Android? I’m getting the G2 if it’s not up to par than I will refund it and get the Mytouch. There is 30 days for exchange or a different phone right? I had the Merlot MyTouch, then gave it to my wife when her contract was up. The new MyTouches were out and had discontinued Merlot, which she wanted. So, I got a black MyTouch Rev.b. I miss my Merlot MyTouch. By the looks of things not even the G2 has an official release date, lol. Sure, there was that Best Buy Mobile press release, but not even their staff agrees with it! You’ll likely have to wait a little longer for a date on the myTouch HD. I did just notice that the http://www.t-mobilescoop.com/HSPADEVICE Scoop article that was pulled a while back is now up again… sans the 800MHz spec and the cheesy looking scorpion. It also says “Take advantage of the pre-sale and get yours.” WHAT pre-sale, T-Mobile?? It makes you wonder why anyone would want the G2 after seeing this. I guess that if you are a die hard keyboard fan, that would be about it. This phone appears to have a better processor, HD out,and FFC (if you’re into that stuff). Not really sure what advantage the G2 really has. Ogopogo… I don’t think anyone is saying this is a better phone or that it trumps other T-Mobile offerings. It is simply another phone added to T-Mobile’s lineup. As to who would want it, for one group I suspect there’s a lot of G1 owners who may “automatically” upgrade to its named successor. That’s not illogical. There are legitimate reasons to want Stock Android and to want a keyboard. G1 owners are used to having both and the G2 is the *only* 2010 device on the market to provide both. That’s no small deal. Ogopogo.. if you don’t want the g2 don’t get it. I guarantee you that there are a lot of us that prefer keyboards and stock android. The g2 will sell without you purchasing 1. Get what you want and don’t worry about what everyone else is going to get. Because the G2 is confirmed and this is rumored. I believe it will have an ffc. The hd out will likely be dlna. Processor will be 8255 or possibly even the 7230(G2). Either way those are single core SoC’s. Remember this is billed as a family phone. but isn’t that what makes it fun! thats all I can think of at the moment, but without complete specs on the G2 or anything confirmed on the mytouch, who knows? Whoops, that wasn’t clear. 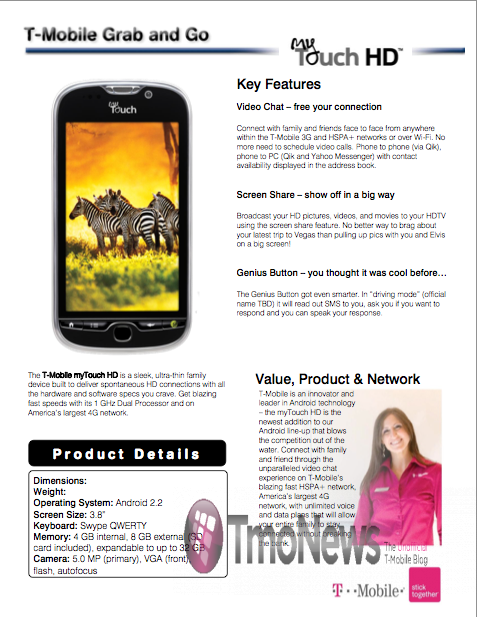 The first set of specs are about the mytouch hd. We may learn a lot from HTC’s event tomorrow. the Desire Z and Desire HD. No more teasing! We want FULL SPECS!!! With similar deductive reasoning based on rumor/speculation, we’ve been able to be almost certain that the G2 was going to have an SLCD when everyone was screaming that it’ll have AMOLED at the top of their lungs. That turned out to be exactly the case. Hopefully HTC will give us real the real deets on the Vision/Emerald (if that’s what the G2/Desire-Z & myTouch HD/Desire HD actually are). Depending on their need for HSPA+ over seas, they may end up with different chipsets, but I doubt that’s likely. So what is so HD about this phone??? Ha! +1 for such an obvious, yet unmentioned color! Is that an official T-Mobile color “eggplant?” If so, I’d like to register strong objection. What limp-wristed pantywaist came up with that name? I hope Herr Humm didn’t approve that name. a double pair of devil horn hands in the air for you, sir. So is it just me or does this basically confirm that the MTHD will not be aimed to the “geeks” like us and will be target to teens. I mean, no superphone, to my knowledge, has launched with a whole bunch of colors like that, at max 2. This basically confirms that the “dual processor” does not mean that it’s a dual core phone, and it will have that horrible espresso bloatware on it (although we knew that). I disagree that geeks don’t like color choices. Ha. Ive seen plenty of Nexus Ones with color cases on them. Dont misunderstand, I’m not saying geeks don’t like colors, but you rarely, if ever, see a superphone targeted to geeks launch with so many colors, at max 2. What they do with their phone after they buy it is their business. I agree. The options of colors on this bad boy sort of cheapens it. Makes it sound like a Sidekick for 15 yr olds. Just my opinion. Still undecided….G2/Vibrant. Talk about cheap… the vibrant looks like it will break if you stare at it too hard…. You wanna talk geeky phones with colors, check out the newly announced Nokia E7 (I think that’s the name). It’s being marketed as a business phone, but it comes in four colors (black, white, red, and forest green). It’s some serious grown-up tech (though not my cup of tea with Symbian^3). Cool, batgirl now has a phone. I’m gonna get my Grimace On with the purple one! I’ll have one eggplant with raw meat red with a martini olive appetizer. G2 or Mytouch HD? G2 or Mytouch HD? G2 or Mytouch HD? G2 or Mytouch HD? G2 or Mytouch HD? G2 or Mytouch HD? G2 or Mytouch HD? G2 or Mytouch HD? G2 or Mytouch HD? G2 or Mytouch HD? G2 or Mytouch HD? G2 or Mytouch HD? G2 or Mytouch HD? G2 or Mytouch HD? G2 or Mytouch HD? G2 or Mytouch HD? G2 or Mytouch HD? G2 or Mytouch HD? G2 or Mytouch HD? G2 or Mytouch HD? G2 or Mytouch HD? G2 or Mytouch HD? G2 or Mytouch HD? G2 or Mytouch HD? G2 or Mytouch HD? = GLACIER! G2 or MyTouch HD or Vibrant? T-Mo triple threat! Will this phone have a physical keyboard? @ Robert I have seen you on this site a couple if not several times, and you seem to make sense, so I’m asking you do you think the G2 is a good Phone whos not to much into this and that, just something that will do what I need which isnt all that mumbo jumbo, you know what I mean. Something to just get me by, I’m normally a BB user and I want to try the Android. I’m thinking about it for my wife, sometimes too much is to much. I don’t want to get something that might be to much and fustrate me or her, what do you think? get da g2. u’ll be fine. This phone looks pretty awesome, though I was shocked reading all the comments that said it would be loaded with Espresso UI. What a frakking drag. My current plan was to take advantage of the BOGO when the G2 comes out to replace the G1 on my account (for someone who just *has* to have a physical keyboard!) and get myself the Vibrant for free. Which I will use until these iPhone rumors prove themselves to be true (knocks on wood). The G1 is truly on its last legs, though– so not sure I can wait til November when this handset is suspected to come out. The Vibrant is fine, it works well enough, but a MTHD in white? HSPA+ and FFC? Pretty slick. Screen is only 3.8″???! WTF… This was supposed to be 4.3″! jesus, people are so difficult to please. 3.8″? TOO SMALL. anything less than 4.3″ isnt going to cut it. OMG, the genius button? might as well be satan’s phone. t-mobile has always placed emphasis on value and bundle plans. not about having the best phone that only a select few can afford. the majority of their customers are families on FAMILY plans, so what is a midschool kid gonna do with a droid x? or incredible? cmon dude. if the phone is that bad take ur business elsewhere. el lloroso, not el guapo. T-Mobile just needs to follow through. This phone needs to be a high quality phone. When customers think of “High Quality Android” they think of the Verizon Droid series. It would be fantastic if that perception was changed. eh forget the mytouch hd, the expresso UI kills it even though the phone does have amazing specs. Its all about the G2 with that android stock. I am starting to think that tmobile is doing that rumored “secret launch” for the g2…im dieing to know the info on when it will be available. ugh, patience is a virtue. I am glad that tmobile is releasing the G2 first instead of the mytouch hd, I would have died if it was the other way around. I understand that custom UIs slow down the update cycle, but HTC has been better than most other manufacturers about updating phones. And if you just don’t like the UI, replace it. Get the phone with the killer specs and make your first download LauncherPro or ADW or any of the multitude of home replacement apps. It’s that simple, not a deal-breaker by any stretch. I see this a lot. Why is it okay for manufacturers to break users can fix it themselves? It’s like Android phones are turning into Windows PC’s where you simply cannot buy a computer that isn’t completely destroyed with craplets. Yeah, HTC Sense is better than the rest, but Stock Android devices should not be as rare as they, IMO. I will take this opportunity to add that HTC now has the G2 on their site. Will the eggplant be lighter or darker than a brinjal? This is wat I been waitin on. I have a mytouch and sound like the t is stepping up to play wit day big boys so legooo. Why can TMobile/HTC come up with phone that has nice chrome trim around like IPhone. HTC phones are very plain and boring in appearance. They do it’s called the Samsung Vibrant. any news on the hd7? is it even coming to the states? I am with you on that one. This phone sounds incredible!! I love Android, but if WM7 is as slick as it looks then I will definitely get the HD7. If the Desire HD will be the Mytouch HD, as the rumors suggest, then it will sell BIG. Either way tmo needs this phone. It did big things for Sprint, increased revenue. And look at that 8255 chip. Nice call! Our chispet hypothesis seemed to have landed dead on for the Desire HD, but it is still a very different device than what’s listed in this myTouch HD Grab and Go. 4.3″ screen, no front facing camera and no trackpad. Of course there’s no kickstand (a la EVO) either so who knows how the internals are going to relate to MTHD. The Desire-Z looks to be exactly the G2, but with Sense. Check out the videos at Engadget and watch this thing but in literally three seconds! :O It also has some awesome Z-lid action. Very classy as well. What’s so bad about espresso? I don’t own a mts but I did play with one briefly in a tmo store and really doesn’t seem as bad as ppl keep saying. I also had an espresso rom on the mt3g earlier this year I’m sure it was stripped down and it was super buggy but it didn’t seem as bad as some comments suggest. Anyone who actually owns a mytouch slide care to give their opinion on it? I had one until my Wife’s G1 died so I gave it to her. I thought it was really slick and it responds really fast. Loaded up ADW Launcher and had no problems whatsoever. I do agree with the above comments about the bloatware. Totally unnecessary. Let me choose what apps to put on my phone. Yea I thought it was really snappy also but I hear you on the bloatware carriers should give you the option to delete that kinda stuff. The Desire HD is NOT, I repeat, NOT the MyTouch HD…. The eggplant link was hilarious! the eggplant link is off the hook….i like the last sentence from tmo..”In case anyone is wondering what Eggplant looks like, click here.”…lol in some way it just made me laugh…. Outside of screen size and camera pixels the mytouch hd seems to be better than the desire hd. if you haven’t seen it yet, check the little write up about this phone on htcPEDIA.com. some neat stuff, seems legit. there’s also some interesting information on t-mobile possibly using the term 4g. Please please please god!!!!! Please let the desire HD be the emarald device for tmo this device looks SOOOOO FREAKING LAME! I’m seriously on my knees typing and praying at the sametime!!! I’ve been waiting for a long time for a good phone to get from TMO and so far… Pretty disappointed!!! Android web from tmo.. 30.99 is a little rediculus that would be my only complaint. @Rick, I felt like that few days ago. But today after all the specs about the Desire HD, I felt better so much better. I guess time will tell but I do have a very good feeling Emerald is Desire HD. According to my own source it will have a Nexus One Body but on steroids , bigger screen and not sure about FFC. It fits the description right? She said maybe a dual core. Honestly buddy, everytime I hear something so optimistic I get hope again haha so thank you!!! I really hope it is, cause I’m holding off but my patience is wearing thin, what phone do you have??? I have a Nexus One. And pretty happy with it cus I know its still has the best support as far as updates and all, but its more than six months and I’m due for a new toy. So as far as a replacement, I want a bigger screen, same type body, same or faster processor, etc.. sounds like Desire HD to me dont you think? It would be nice if there is a FFC but, we cant have everything we want right. What does FCC mean/stand for? And Isn’t the Desire HD the G2? desire hd is NOT the g2.